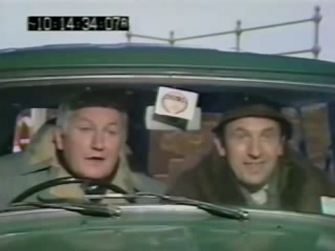 A 1974 entry into the long-running Comedy Playhouse anthology, Pygmalion Smith finds Pygmalion ‘Smithy’ Smith (Leonard Rossiter) running a low rent photography business out of a wooden shack on a seaside promenade. Convinced that only circumstances are holding him back from becoming the next David Bailey, Smith is searching for the next big thing and believes he’s discovered it in the form of Auriol Pratt (Barbara Courtney) – a statuesque brunette who fillets fish in the grimy fish sheds nearby Smith’s ailing photography firm. Determined to capture the beauty of a woman he considers “the next Twiggy”, Smith sets about tracking down this enigmatic muse and making her a star – along with pocketing a few quid for himself. Aided by PE teacher and his childhood friend Brewster (T.P. McKenna), Smith attempts to make his approach, but is constantly thwarted by the number of male suitors lining up to take Auriol out. Or by the sea coming in and soaking his shoes in front of a dismissive Auriol. The episode aired on a Tuesday evening at 8.30pm on BBC1 in June 1974 and never received a repeat airing. Roy Clarke has the type of writing CV that most writers would give not just their right arm for, but probably all their limbs and appendages for. Last of the Summer Wine, Keeping up Appearances and Open All Hours are sitcoms ingrained into the texture of British comedy and have proved phenomenally popular over the decades. And, even in his 80s, Clarke's spectacular command of 'the funny' is evident in the scripts he is banging out for Still Open All Hours, all blessed with his surgical precision for delivering gags which cut straight to laughter. Pygmalion Smith, however, is somewhat of a misstep, an arrow shot by a shaky hand which fails to hit the mark and doesn’t even end up landing in the posterior of a vicar to provide a guilty laugh. 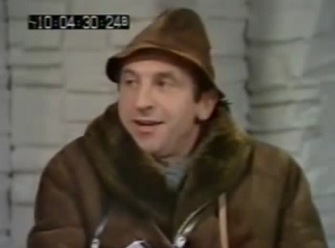 With Leonard Rossiter starring, you’d be forgiven for assuming that Pygmalion Smith was primed to succeed. And Rossiter is clearly at the height of his powers as a little sitcom by the name of Rising Damp was due to start airing just two months later. There are hints of Rigsby in Rossiter’s performance of Pygmalion Smith, the frantic mannerisms abound and there’s an air of desperation, but it’s a malaise which doesn’t quite work. Whereas Rigsby was riddled with tragedy, Smith lacks that dimension of pathos and, instead, comes across as creepy. Judged by the sexual politics of the 21st century, Smith – in his pursuit of Auriol – could easily be mistaken as a predator who objectifies women. There’s a scene where Smith and Brewster lurk outside Auriol’s house and, despite Smith being laden with chocolates and flowers, there’s something just a little stalkerish about it. And then, minutes later, Auriol appears and the viewer is ‘treated’ to a long lingering shot of her lenghty legs rising up into a suitor’s car. Now, British comedy of the 1970s had more than a habit of objectifying women – just check out the opening credits of Man About the House – so it’s no surprise to find a little bit of titillation, but it feels highly antiquated and unnecessary now. Regardless of the sexism, even if Pygmalion Smith is stripped of the waggling bums (which inexplicably get a big laugh from the laughter track) and the long legs in stripper heels, the most startling aspect is that it's still incredibly unfunny. And Roy Clarke is a funny, funny man – he even debuted a gag in Open All Hours about a brush having had several new heads and handles several years before John Sullivan penned it for Trigger. Pygmalion Smith, however, resolutely failed to make me laugh, the closest it came was a wry smile when Smith banged his testicles whilst hopping over a rail. There’s an inherently sadistic hilarity in seeing a man damage his precious reproductive organs, but Pygmalion Smith fails to partner it up with any comedic teammates. Pygmalion Smith is a strange beast, it didn’t leave me gnashing my teeth in anger and cause dried spittle to form in the corners of my mouth, but it was a half hour afflicted with furtive glances to the timer to see when it would all be over. Perhaps it concentrates a bit too much on the sit of the sitcom rather than the characters, a full series – on this showing – would be highly limited, so it’s no surprise this remained a one off; Roy Clarke’s The Magnificent Evans was a much different affair despite the photography link. Pygmalion Smith is just too uneventful, too underbaked, too lacking in charm and all of this only serves to intensify its power to disappoint. I guess that, if anything, Pygmalion Smith proves that even the very best can have an off day. And, as we all know, Clarke and Rossiter went on to create some of the finest comedies in British history, so we can't complain too much. The whole episode can be found on YouTube by clicking this delightful link. Oh cheers for the link, I've often wondered about this whenever I've come across comment about it. I must admit though my critical eye is a little bit more critical when it comes to Clarke. I think he coasted for several years with Last of the Summer Wine effectively turning in the same script each week and I fear he's doing the same with Still Open All Hours now. Indeed, I actually feel Still...has more in common with Summer Wine than it does the original Open All Hours now, given its focus on the peripheral supporting characters, domineering matriarchs and henpecked hubbies. Even Tim Healy's Gastric has more than a touch of Summer Wine's Wesley about him. It's a shame because I really enjoyed the one off episode they did a few Christmases back but have felt each series that has followed has had the law of diminishing returns. It doesn't help that David Jason isn't as generous as Ronnie Barker was as evinced by the comic dead wood of a Granville replacement he has. I also get niggled by the age inconsistencies too: surely The Black Widow would have long been dead by now, given that Stephanie Cole was playing much older than she actually was back in the 1970s and '80s - but now she appears to be the same age as Granville, which leads you to wonder just how old Jason was supposed to be in the original as I always thought he was playing a much younger person! Still Open All Hours is somewhat of a guilty pleasure for me. I don't catch it every week, but when I do it's a nice bit of escapist fluff. And it appears to be one of the few trad sitcoms that are still on - I genuinely can't think of any others in the last few years, but maybe the rest have flown under my radar.